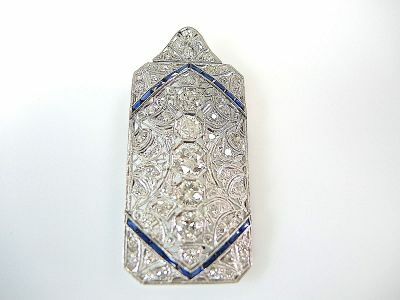 One platinum Edwardian pendant. One old European cut diamond (1.02 carats: VS1 clarity: G colour). Four old European cut diamonds (2.31 carats: VS-I1 clarity: G-H-I colour). Fifty old European cut diamonds (2.65 carats: SI-I1 clarity: H-I colour). Twenty straight baguette synthetic blue sapphires (1.65 carats).